Named the "Phantom" this tree is on the eastern slopes above Lake Okataina. 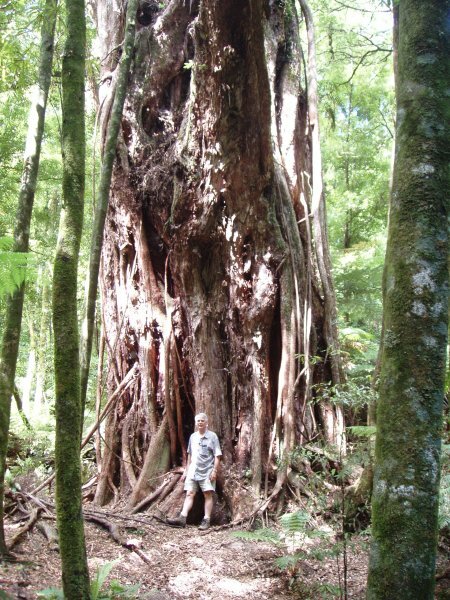 It is in a patch of forest which has survived the Tarawera eruption in 1886 and there is volcanic ash still trapped in the forks of the crown. 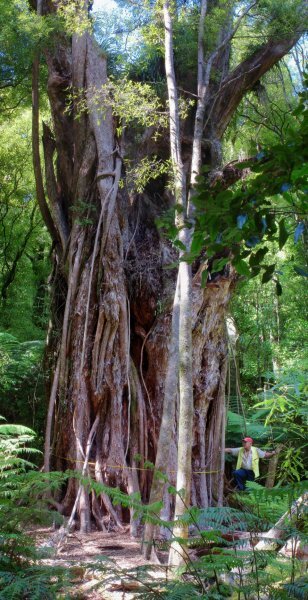 It is one of a number of large rata trees in this area. This tree has probably started in the crown of another tree and the trunk is formed by a large number of roots merged together to form a relatively solid trunk (Ecroyd, C.E. 2013). Close bush makes establishing the highest top difficult. Difficult to measure the trunk accurately because it is very rough with many small roots etc. Health of this tree is very dependent on possum control being carried out in the area. There is much possum sign beneath the tree and in the canopy. a fairly solid looking trunk but formed by merging of many roots and stems. 19 Oct 2014 Waddell, P.J., Beets, P., Forrest, S. & Hejlm, F.
27 Feb 2013 Seccombe, W., Sisam, H. & Ecroyd, C. E.
It is about a two hour walk to this tree from the carpark at Okataina. You start on the well formed track to Humphries Bay and after about one hour follow an unofficial side track up hill to the tree.